Dona Terezinha with its endearing friendly environment and quaint pool side settings, with tables all around and tall swaying palms interspersed form a characteristic feature of the resort. The resort is mainly made up of rooms that surround a central courtyard. 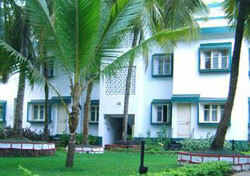 It offers you well appointed single and double bedroom apartments (A/C, Non A/C). Most of the balconies overlook the central courtyard with its pool. Enjoy the day lazing it out in the hammocks, tied between tall swaying palms in the midst of a well appointed garden with lush green lawns. You could also liven up at the tennis court and maintain your agility. Dona Terezinha is situated close to the Calangute beach, in a colourful area which is ideal for shopping and sightseeing. Its warm hospitality, with all the essential's for a comfortable stay make it. " The perfect holiday spot" of your choice.. Enjoy the cool of the evening by the pool side, sipping your favourite drinks from a well stocked outdoor bar and watch the cultural shows and folk dances which will entertain you till late evenings. Besides this a live band will be in attendance. Treat yourself to the culinary delights of seafood specialities at the rustic restaurant " Have More" aptly named due to the irresistible preparations. Swimming pools, Laundry Services, Major credit cards accepted, Money changing facilities, Safe deposit lockers, STD/ISD facilities, Ayurvedic Massage, Landscaped Gardens, Doctor on call, Taxis available outside the resort, Shopping Arcade. Room Facilities: Attached bath with Running Hot/ Cold Water, CCTV in room, Mini Bar in every room on request.